When I was little, we learned the letters of the alphabet the traditional way, learning the names of the letters rather than the sound they make. We had very limited access to audio-visual aids, so all learning was book based. We started with A is for apple and went all the way to Z is for zoo, looking at pictures of things as we went along. I don't have enormously pleasant memories of the experience. It felt like studying. I look at J now, tackling the alphabet at nursery school. And I love the phonetic approach being used where he is learning the sound each letter makes before learning what it is called. They are being shown everyday objects that begin with a particular sound, they are singing alphabet songs and making marks in sand trays as part of the play-based learning experience. And my heart is glad. For J is enjoying his learning journey. This brings me to a lovely little learning aid featuring the well-loved characters from The Sooty Show. The Sooty ABC - Learn the Alphabet DVD. The Sooty Alphabet DVD is a fun way to introduce little ones to the alphabet and it supports the Early Years Curriculum as well. Sooty, Sweep, Soo and Richard embark on an adventure full of fun and mayhem as they make their way through all the letters of the alphabet. The gang visit Wookey Hole near Wells in Somerset and find themselves in a race against time to find things that represent every letter from A to Z. There are lots of gags and slapstick humour all the way through that are sure to keep little ones enthralled as they develop early literacy skills. There are lots of bonus features packed in too. The DVD houses three classic episodes from the Sooty TV series along with a printed A-Z poster and printable worksheets. My J has fallen in love with Sooty and ends up singing the alphabet song with Sooty at the end every time he watches the DVD. I am pleased with how the storyline has been developed and embodies the essence of fun and play-based learning. 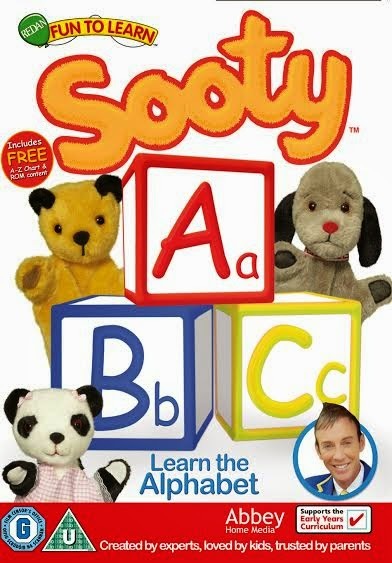 You can also be in with a chance of winning a Sooty ABC Learn the Alphabet DVD. Just enter via the Rafflecopter below. Good luck! Disclaimer: We were sent a copy of this DVD for the purpose of this review. All opinions are my own. My son has recently discovered Sooty and really enjoys the show. This is a great prize. Sooty is such fun and this would help reinforce the phonics they are learning at nursery. My daughter would get a lot out of this at the moment! Mine are a bit past the alphabet, but do love Sooty - wonder if they'd do an algebra one?! Great show and a very handy DVD if you have kids at the right age. ah what a blast of nostalgia, love sooty! Ah these types of educational DVD's are a must really, gets the kids away from the brain dead games and crazy tv shows! Love Sooty!